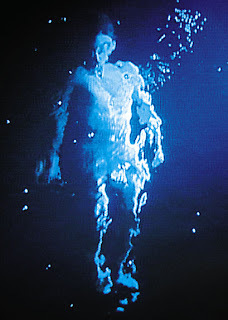 I enclose links to two video's by my art 'hero' Bill Viola. The first piece I first came across when I lived in France. On my day off, I found details of an art exhibition by an artist I had never heard of, a chap called Bill Viola. The write up sounded interesting so off I went. The exhibition included the piece below (I have a snippet here) called The Crossing. It was massive, arresting, and forced me to ask questions abput myself and my mortality. I cam away open mouthed, awed that art could ask me those huge spiritual questions and it was love at first sight. The second piece that I enclose a link to, is a piece that I didn't see for a long time, but was to impact my academic life. The piece is called 'The Messenger' and was commissioned by Durham Cathedral. Again this is a massive, arresting and deeply spiritual work and continues Viola's fascination with mortality and the spiritual. I later studied Theology at Durham and did an MA the title of which was 'Rites of Passage: A Theological Reflection on the Contemporary Video Artwork of Bill Viola.' My thesis was to do with Postmodern thought and culture and anthropology (the theology of what it means to be human.) I enclose the thesis here for your delectation and delight. '...It is clear that our culture is experiencing a time of crisis. Some have put this down to the death throes of Modernity giving way to Postmodernity. This paradigm-shift has led to the death of meaning, unregulated interpretation, and assertions of the will to power which disregard the Other. It is also a time where the sublime is re-presented. The postmodern sublime arises out of the gap between conception and imagination. There is a yearning to be able to bridge that gap, but not by longing for a non-existent Golden Age, but rather by re-presenting the unrepresentable with a disfigured form of the signifier itself. This whole project may be put down to a corporate crisis of Self. It seems that the struggle we are witnessing today is not between moral beliefs or the legal system and individual freedom; it is between our inner and outer lives, and our bodies are the arenas where this is being played out. I will show that the mind-body problem is reaching crescendo latterly, as an ecological drama where the realisation that the environment and our bodies are one and the same. This ‘making strange’, which implies a distance between subject and object, has been the basis of Viola’s work. It is at this point of risk where art and science may be unified with all created activities. It is a point of theoria, transfiguration, and personal transformation where art recreates the viewer and moves us beyond the postmodern flux of the self. Viola’s work is a meditation on states of consciousness and being in which dream and reality are indistinguishable but where what lingers in the mind is a state of confusion in terms of what is seen and in registration of external data. Viola demonstrates that states of mind and vision are one and the same. I will show that a critique Viola’s work is based on the understanding of the confusion in postmodern culture between transcendence and the sublime. I will also show that the anthropology that underlies his work, and postmodern culture in general, is a sense of abjection – that is repulsion of the Self and the Other. This does not lead to a theoria, but rather a self-deluded postmodern narcissism in the guise of theoria. This is not in line with a Biblical understanding of the self, based on the Imago Dei in Genesis.